Bake a round cake the size that you need. With an icing filled bag and round tip, size #5, draw the face and lines on the top of the cake. You will use the star tip, size #18 to do all of the fill in work and the round tip, size #5 for all of the outline work. First fill in the eyes using white, blue and black icing. Now fill in the mouth using red icing for the tongue and black icing to fill in the mouth. 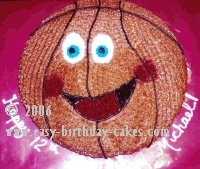 Make a medium brown colored icing or orange icing the color of a basketball. Fill in the rest of the cake following the curved lines. Use a red food color spray (also known as color mist) and spray a small circle at the ends of the mouth. With black icing do the outline work around the mouth and the lines on the basketball.